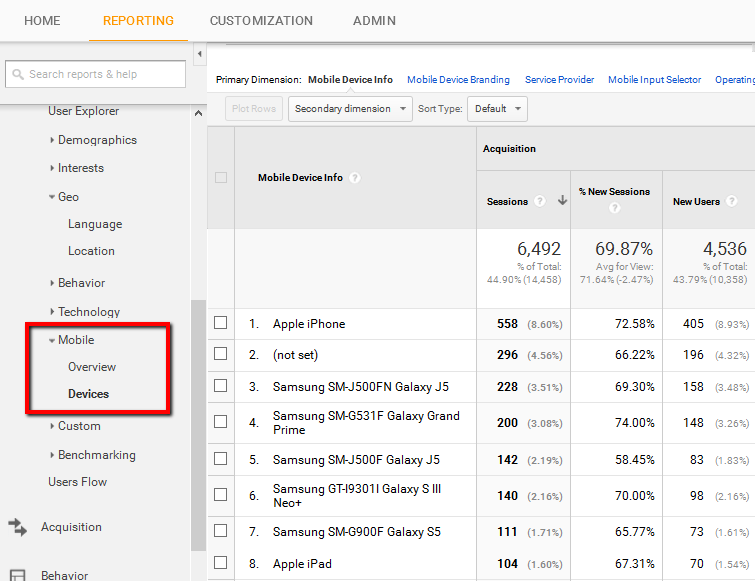 Mobile analytics studies the behavior of mobile websites. It gathers the data collected from the users accessing the website via mobile devices in order help you evaluate the performance of the mobile websites. Since having a responsive website design is one of the key aspects of being successful and competitive on online market nowadays, analyzing mobile analytics can be a step forward in the process of improving your website and leveraging the fact that the world is going mobile. The data gathered through mobile analytics are compared against KPIs in order to help you determine the performance of your website on mobile devices. This can also help you identify potential problems with your website in terms of optimization for mobile devices. It is highly recommend that you devote time to improving mobile user experience as this medium can generate a huge amount of traffic and it can lead to great benefits for your company. Otherwise, you will be missing out this part of online community, and you will not be able to stay competitive on the market. The problem could be solved by tracking unique user identities, which will enable you to track repeated visits and compare them to the unique visits. In order to solve the problem of unreliable data, some mobile analytics software even detect only one visit per day. However, the drawback of this approach is that you are unable to detect the number of repeated visits from the same user. HTTP referrer identifies the address of the webpage that linked to the resource that user asked in his or her request by clicking (tapping) on the link. Checking the HTTP referrer allows you to see where the request originated, which provides important data for website analytics. However, the information about HTTP referrer is usually not available for mobile web browsing. There are several reasons for this. Occasionally, mobile devices have this option disabled by default in order to reduce the bandwidth during the process of accessing the internet. Another reason why these data are not available for mobile devices is that mobile network operators remove these files automatically to gateway software. The data about IP address can also be difficult to track, as the IP address with mobile web browsing is collected through internet gateway, which is supported by the network operator. Unlike with desktop browsing, where each computer usually has its own network address, IP address with mobile browsing depends on the network operator, which is why it can change and provide analytics data that are not reliable. Successful mobile analytics can help you go beyond comparing the analytics from desktop and mobile devices, but it should also provide detailed insights into signals generated from mobile devices, in order to determine information about your mobile users. One of the best ways to do so is using tracking solutions that leverage devices IDs, which offers a sophisticated form of tracking mobile audience. The purpose of mobile analytics is to analyze the performance and potential of the mobile market, to determine the data about the audience, to calculate ROI of mobile marketing and provide insights into how mobile promotion affects your business. These insights will help you learn how mobile users get to your website and what they do on the website, how they are browsing through pages and what kind of content they find most valuable. The type of devices can also be obtained while collecting the data about the users. Understanding your audience is the best way to learn more about your own website, which aspects you are doing good, and which ones you should improve. In general, knowing how mobile users interact with your website will help you improve your website to get the best performance and provide mobile-friendly user experience. Analyzing the differences between desktop users and mobile users might be much more important than you have imagined. Mobile users maybe have different needs when browsing your website, as opposed to desktop users, which requires you to adapt the mobile website to the needs of the mobile users. This will help you maximize the performance of the website among mobile users, as website designed according to their needs and pattern of browsing is easier to navigate and use. Although mobile analytics, and analytics in general, is focused on exploring your own website data in the purpose of evaluating performance, sometimes you need to go beyond these borders. You should firstly focus on your competitors and try to get the data about their performance in order to see if there is something they are doing better. Besides competitors, you also need to monitor the influential companies from the world of online marketing, as such examples can provide valuable information for your own company. Finally, you should explore the world of analytics in depth, as you might find new practices and solutions for analyzing mobile analytics, as this is the area that changes rapidly, introducing innovations constantly. 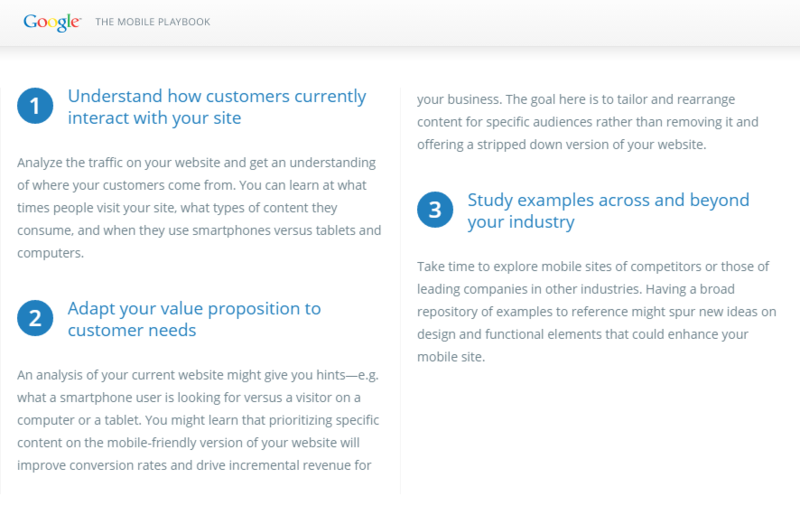 If you want to learn more about mobile marketing and how to define your mobile strategy here’s a helpful guide: The Mobile Playbook.